I saw this idea on Pinterest using larger blocks, but I really wanted to try it with 1 1/2" ones. My sweetie cut about 50 of these blocks for me and I used 44 of them (for a set of these). I sized my pictures in Photoshop and then printed them on sheets that were 12x18 (at Costco). 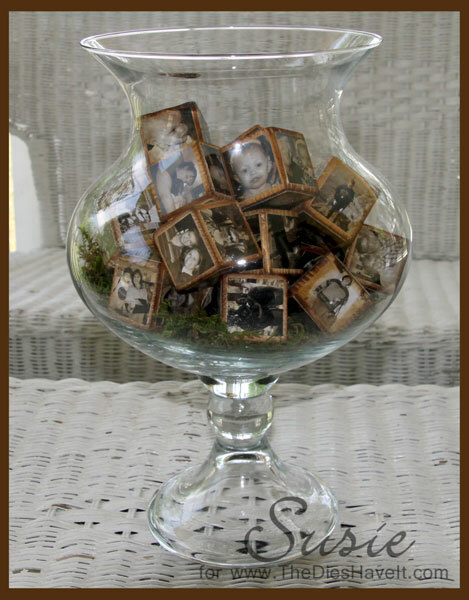 I used a punch to separate all my little square treasures and then adhered them to each side of the blocks. I used Distress Ink and a blender tool to age all of the blocks and I must say...I love looking at these on my dining room table. And I love when my grandkids notice their pictures....it makes them happy too!